If you are considering doing a Los Angeles home renovation, one of the first things you should consider is doing a home performance upgrade. While it will be very exciting to transform your bathroom, or cook in your remodeled kitchen, it will also be worthwhile to consult with a Los Angeles contractor about doing changes that will help you to save more energy and water usage. Busch Design Build, Inc. specializes in making your home more green and eco-friendly. Read below for five tips about Los Angeles home performance upgrades. 1. Air Leaks – While you probably can’t see them or feel their effects directly, air leaks do exist in most older homes. They can be found in windows, doorways, walls, around fireplaces or heaters, etc. If you have many of these air leaks around your house, they can be causing air from the outside to flow in, and air from the inside to leak out. This means that during the winter months, while you are heating your home, cold outside air still seeps in. And during the summer months, when you close all windows and turn on the air conditioning system, hot air still comes in through the cracks. Have your contractor assess your place and figure out where the air leaks are as part of your Los Angeles home performance upgrade. Fixing the leaks will not only help you save money on your utility bills, but will make your home more comfortable. 2. Solar Water Heating – We previously spoke about the advantages and disadvantages of using solar panels in another post, but did you know that you can use solar energy to heat up your home and water, as well? 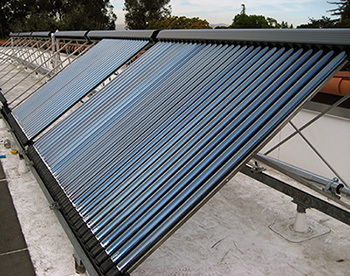 Solar hydronic technology, also known as solar thermal, consists of the placement of evacuated tube solar thermal water heater collectors on your roof. The sun will heat up your water, making it circulate throughout your house in pipes. You can use this process to heat up water in your home, and also as a space heater, in addition to your regular heating system. This will help you not burn fossil fuels when using a regular heater, and lower your monthly bills as part of your Los Angeles home performance upgrade. 3. Energy Star Appliances – When consulting with your Los Angeles contractor about making your home more eco-friendly, the most important change to make is perhaps upgrading your appliances. Older appliances waste water and electricity every time you wash dishes or clothes, or refrigerate your food. Energy Star provides the following calculations of savings with upgrades. By purchasing a new Energy Star refrigerator, you will save “$200–$1,100 on energy costs over” a fridge’s lifetime. Since you can usually purchase a fridge for around $1,000, the appliance will basically recoup its cost after years of owning it with savings on your utility bills. In addition to savings, purchasing Energy Star appliances will benefit the environment because it consumes less energy. The site claims that “if everyone purchasing a refrigerator this year chose a model that has earned the ENERGY STAR, together we would save 715 million kWh per year and reduce greenhouse gas emissions equivalent to those from about 100,000 cars.” And Energy Star doesn’t just stop at promoting eco-friendly refrigerators, they also certify water heaters, dishwashers, laundry machines, etc. 4. Insulation – In our post called Five Important Ideas for a Malibu Green Construction Project, we wrote about how insulating your home will save you money on your heating and cooling costs. Green Building Solutions claim that “homes built before 1978 are unlikely to have insulation in the walls or underfloor area (if present). Insulation installed in attics 25 or 30 years ago may have settled, been crushed or displaced by workers, or even contaminated by animal intrusion. Older homes may not even have any attic insulation.” You can choose to insulate your entire home as part of your Los Angeles home performance upgrade, or just add insulation to much-needed areas. You can choose from fiberglass, foam and cellulose, and add it to floors, walls, or the attic of your place. 5. Air Conditioner and Heater Maintenance – A Los Angeles home performance upgrade doesn’t have to mean solely purchasing new items. Sometimes, all that is required is a tune-up to your existing items. Just as you service your automobile, remember to service your air conditioner and heater yearly. Energy Star recommends hiring a Los Angeles contractor to check these systems pre-season, before they get busy with broken HVAC systems. So, tune-up your heater in the fall before the winter months, and your AC in the spring, before the summer heat kicks in.